Hey everyone! 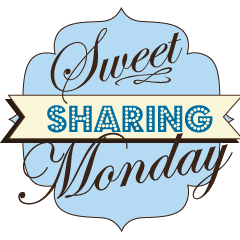 Welcome to the second episode of Sweet Sharing Monday! I was so tickled with all of the wonderful links from the first party- dont forget to check out last week’s features here. I hope that this party will be a place for others so share, support and be inspired by each other. Don’t forget to Check back on Thursday to see which link was the most viewed! Thank you for hosting! Have a great Monday! Jen Lossing, The Consigner Designer recently posted..LIGHTEN UP! Thanks for hosting the linky party again! I hope you’ve had an awesome week! Ami w/ AliLily recently posted..Are you going to SNAP?!? Hey! Thanks so much for stopping by Aprons & Ambition and inviting me to your party. I’ve dot it on my list of awesome parties…so I’ll be back next week. You have such a fun site. I really enjoy stopping by here, especially on Mondays to see what everyone is creating. Tara Rose recently posted..Oh how I love French Fries!! Thanks for inviting me to your link party. I also added a fun origami box that can be made from kids’ art work. Thanks for hosting, and have a great week! Thanks so much for the invite and for hosting!! Have a great week! Thanks for inviting me to your party and thanks for hosting! I am your newest follower! Thanks for inviting me to your party. I must have missed it. I hope that you host another one that I can make it too.